The holidays are a time of celebration and joy, connecting and reconnecting with friends and family. Many gatherings will have an abundance of food. Holiday feasts however, can be tricky; home chefs are often preparing a meal they don’t normally cook, and they’re preparing it for a larger group than usual. For many parties, different types of foods are often out in the open for extended periods of time. This can set the stage for some types of food borne illness (AKA food poisoning). Food poisoning can be divided into two types: Toxin-mediated vs. Infection-mediated. Toxin-mediated food poisoning occurs when bacteria grow on food (which occurs at certain temperatures) and release a toxin as they multiply. This toxin then causes the unmistakable effects to nausea, vomiting, diarrhea and/or stomach aches. Staphylococcus aureus, more commonly known as staph, is often found on skin, finger nails and noses. When a person with staph on their body contaminates food, the bacteria can grow and as it does it excretes staph enterotoxin. This toxin is a common cause of food poisoning. Staph can linger in foods such as meat, poultry, eggs, dairy products, creamy pasta and potato salads, and cream filled baked goods like eclairs and cream puffs. Symptoms develop quickly after eating the contaminated food – within one to eight hours – and may include vomiting, diarrhea, nausea and abdominal cramps lasting one to two days. 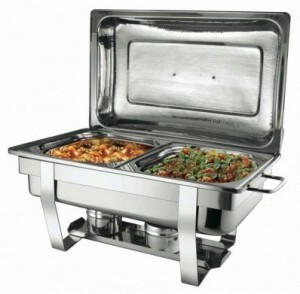 Clostridium perfringens, also called the “buffet germ” is associated with foods that are in chafing dishes where the temperature may not be properly controlled allowing the bacteria to grow. Clostridium perfringens is found in soil and can be part of normal intestinal bacteria, but a large number of ingested bacteria can excrete a toxin that makes people sick. Symptoms usually develop within 8 to 24 hours and may include diarrhea, stomach pains, nausea and sometimes vomiting. The symptoms are short lived, and usually last only for a day. Infection-mediated borne illness occurs when ingested bacteria or viruses grow inside the body and make the person sick. Campylobacter is a very common bacterial cause of diarrhea and according to the CDC, 1.3 million Americans are sickened every year. Campylobacter infections are almost always isolated to a few individuals or small groups that have eaten undercooked poultry, however widespread outbreaks associated with unpasteurized milk or tainted drinking water have been reported. Symptoms include diarrhea (occasionally bloody), cramping, abdominal pain, and fever within two to five days after ingestion of the bacteria. The illness typically lasts about one week. Salmonella is probably the most well-known of the foodborne illnesses. This bacteria is found in the intestinal tracts of animals. 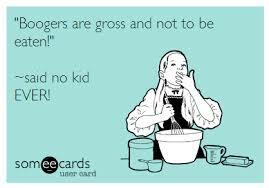 When salmonella infected feces contaminates food products and the food is not properly cooked, the bacteria can be transmitted to humans. The best way to prevent salmonella infection is to always cook meat and eggs to the suggested temperatures and be careful not to contaminate other foods with the juices from uncooked meat, poultry or eggs. Norovirus, probably most famous as being the “cruise ship virus” is capable of infecting large numbers of people. The CDC states this is the most common cause of food borne disease in the US. It is more common than the other 4 combined. Norovirus is a very contagious virus and exposures to the virus can be from an infected person, contaminated food or water, or by touching surfaces contaminated with the virus; 70% of outbreaks are related to an infected food handler. Symptoms include vomiting, diarrhea, fever, muscle aches and usually last from 1-3 days. Use a meat thermometer to confirm that meat, pork and poultry are properly cooked; visit foodsafety.gov for proper temperatures. Keep preparation and storage areas, including countertops, stovetops and refrigerators, clean. Wash hands with soap and warm running water for at least 15 to 20 seconds before preparing any foods, and especially after handling raw meat, poultry, fish or eggs. Wash utensils between each use. Never reuse utensils without washing them, because dirty utensils can be a source of contamination. 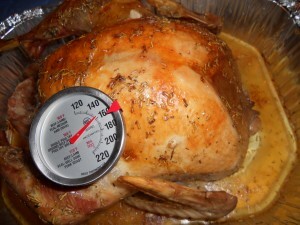 Thaw meat and poultry in the refrigerator or microwave, not at room temperature. This may take several days for a large turkey. Do not prepare food if you are sick or have any type of nose or eye infection. Store raw food below cooked food in the refrigerator so it cannot drip onto and contaminate cooked food. 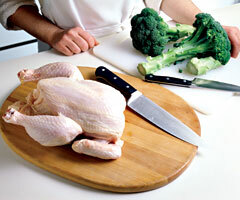 Use separate cutting boards for meats, poultry and fish. To ensure that leftovers are safe the next day, properly seal and store food in the refrigerator as soon as possible. If you are unsure about how long perishable food, particularly meat, poultry and dairy, have been left out, throw the items away to eliminate your risk of food poisoning. Till next time and have a Safe and Happy Holiday Season! The New Stomach Bug: Cyclospora Spreads Across the U.S.